Navigation is a site-wide element that appears on every page; learn more about the navigation elements. While navigation is automatically generated as you build your site, configuration options are available to arrange your navigation and create external links. 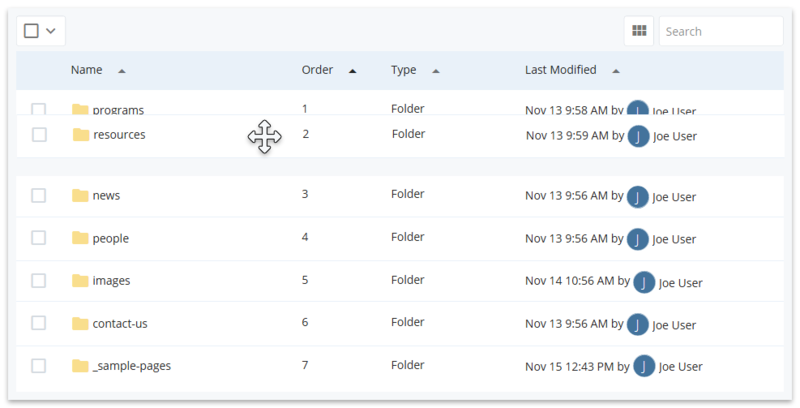 Changing the order of items in the navigation can be accomplished with a simple drag and drop maneuver. Your cursor will change to a four-headed arrow when dragging and dropping items into place. Assets can be moved up or down using tools provided. Additional steps are provided below for specific areas of navigation. After selecting an asset's checkbox in the workspace, tools become available to move the asset into a new position. Notes: The tools are available only after the assets have been chronologically ordered; the tools are not available if more than one asset's checkbox is selected. Top Navigation is the horizontal menu that is visible on every page. While editing a folder, the setting for Navigation Area must be set to Primary for it to appear in the Top Navigation. Follow the steps below to rearrange the items. Side Navigation is the slide-out menu that contains Primary (upper) and Secondary (lower) areas. Follow the steps below to move items into a specific area. You may add an external link (i.e., a link to another site) to any area of your navigation. 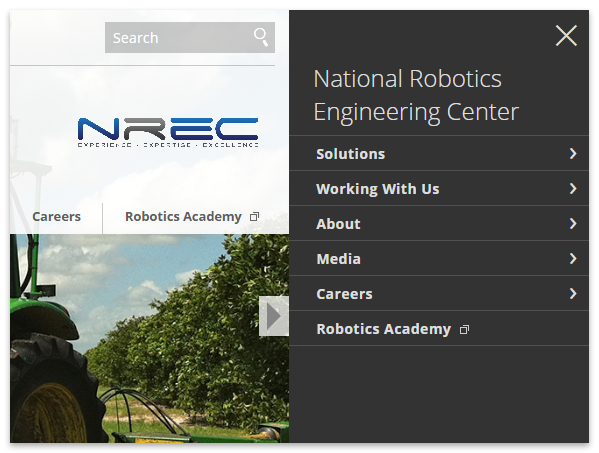 The NREC site contains an external link in the navigation for Robotics Academy; external links are denoted by a square icon. Each time you modify the navigation, you will need to perform a full-site publish. How come my pages are not appearing in the navigation? Is the item set to be included in the navigation? Does the folder have an index page? Indexing is another method of including items in the navigation and is enabled by default but may have been disabled. Item has been rearranged to positions 1-10 but is not appearing in the Top Navigation. Check the settings mentioned above to ensure navigation is fully enabled; if so, edit the folder and ensure that the Navigation Area is set to Primary. How can I move a page to the Secondary area of the Side Navigation? How do I disable a page/folder from appearing in the navigation? For pages, edit the page and change the setting Hide from Navigation to Yes. For folders, edit the folder and change the setting Include in Navigation to No. Can I turn the breadcrumbs off? Turning off breadcrumbs is possible but only recommended only for stand-alone pages (i.e., a page that does not need to be accessible through the site's navigation, such as a landing page for an email blast). Turning off breadcrumbs will also disable a page from appearing in the navigation. Why is the navigation different from page to page on my live site? If you are seeing discrepancies in the navigation of your live site, perform a full-site publish, then refresh the pages in your browser when the publish is complete. Since the navigation is a site-wide element, any changes made to it will require every page to be republished. Does the navigation text wrap? Yes, it will accommodate the entire page Title; if you prefer to display a shortened version of the page Title in the navigation, specify this in the page's Display Name under its Metadata tab. When does the Side Navigation appear? The Side Navigation appears when you visit a section of a website that contains subpages within it, and they are visible in navigation. For example, a Resources section that contains multiple subpages within it for different audiences, such as Faculty, Staff and Students. Whether you are on the index page of the section, or on one of its subpages, the Side Navigation will appear. The display of the Side Navigation is automatic and cannot be turned on or off on a page-by-page basis. However, website visitors can always open or close the Side Navigation manually using the Hamburger Menu to open it, or the X to close it. The Side Navigation is always closed by default on the home page of a site. I deleted a page from my website, but it still shows in the navigation. When I click the link, it says "File Not Found." How do I fix this? Follow the instructions for fixing the 'file not found' error when using the navigation.